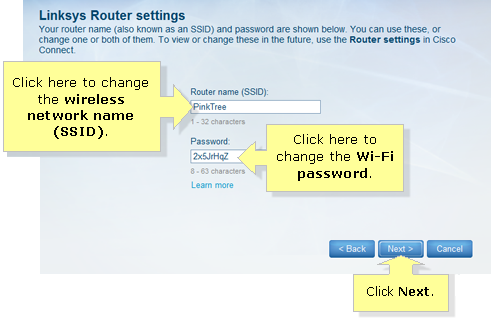 How do I set up my Linksys Wi-Fi Router if I don't use the Setup CD? 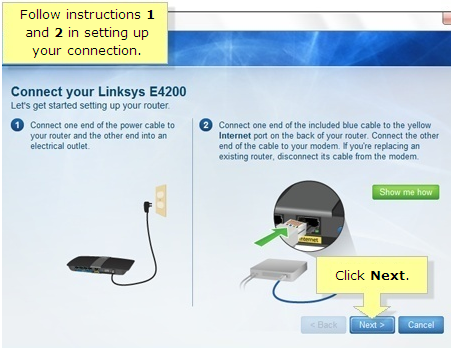 In case your computer has no CD drive or you lost the Setup CD, you can still install your Linksys Wi-Fi Router by downloading the Linksys Connect Setup Software from the Linksys Support Site. To do this, you need to connect your computer first to a network with an active Internet connection or directly to the modem. IMPORTANT: Not all Linksys routers are compatible with Linksys Connect. To know what routers are compatible, click here. 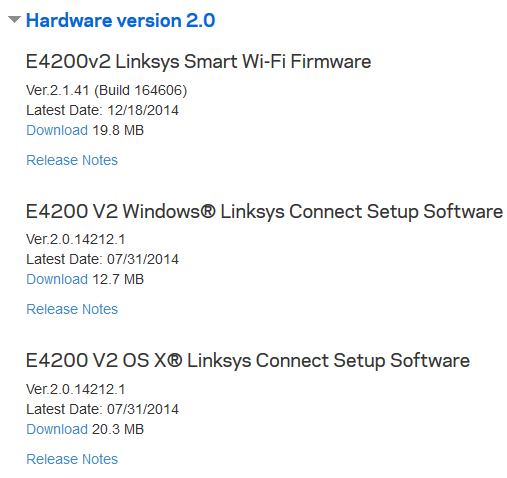 If you want to download the firmware or driver for your Linksys device, go to the Linksys Support Site and search for your device’s product page. For instructions, click here. Go to the Linksys Support Site. Enter the model number of your product in the Search field and click on it. Click on the DOWNLOADS / FIRMWARE button. Locate the Setup Software for your computer and click Download. 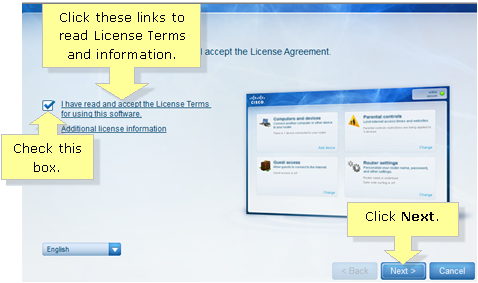 NOTE: When the End User License Agreement prompt appears, click the AGREE button. Save the Setup Software and select a location on your computer to save the file. It is recommended that you save the file to the computer's Desktop. Double-click the Linksys Connect setup file that you have downloaded. Click the License Terms link to read the license terms and information. Then check the box once done. Click Next. Follow instructions 1 and 2 on the setup screen. If your Internet connection is through satellite, T1 or fiber optic that doesn’t have a modem, connect the existing Ethernet cable to the yellow Internet port of the router. Click Next. NOTE: Linksys Connect will then start configuring your network. Do not close this window. The setup process will automatically generate a unique Router name (SSID) and Password for your network. You can change this information by editing the automatically generated SSID and password for your wireless network. Click Next when done. The setup will automatically identify your Internet connection type. 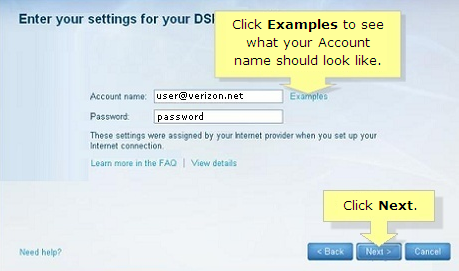 If the software detects that you are using a DSL connection, a screen will appear to let you enter your user account details in the required fields. After doing so, click Next. QUICK TIP: Your Internet Service Provider (ISP) provides both the Account name and Password. If you do not have these, call your ISP. NOTE: The setup will finalize your router’s settings and attempt to establish the Internet connection. If the setup fails or the installation freezes in the middle of the process, you may need to do more troubleshooting steps to resolve it. For more information, click here. You will then see a confirmation window showing that you are now connected to the Internet. Click OK to continue. You will be redirected to the main Linksys Connect window. This window contains options that allow you to manage and personalize your network settings. 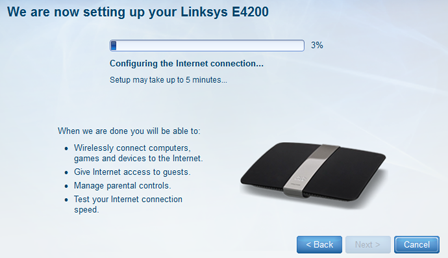 However, if you have encountered an error while setting up your Linksys device, click here for more information. 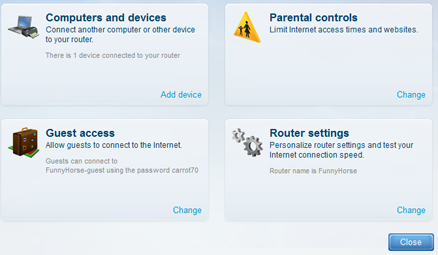 NOTE: The Linksys Wi-Fi Routers, E800, E900, E1700, and E2100L do not have the Parental controls and Guest access features. NOTE: If you want to configure the wireless settings of your Linksys Wi-Fi Router without using Linksys Connect, click here. Once you’ve set up your router and already configured your wireless security settings like the Router name and Password, you are now ready to connect your wireless computers and devices to the network. To learn more about connecting your wireless devices manually, click here. If you’re using Linksys Connect, click here. There are instances when you experience Wi-Fi dead spots or locations in your house where there is poor or no signal from the wireless router. This may be caused by obstructions such as walls, furniture and fixtures or just areas that are out of range of the router's signal. The Linksys Range Extender is a device that will provide the solution to getting poor or no signal because it extends the wireless range of your main router. For more information on how to extend the range of your wireless network using the Linksys Wireless-N Extender, click here. To learn how to set up your range extender, click here.